Israeli clean tech companies to head to California for future cooperation, hopefully. Based on the successes of matching clean tech companies from Israel last year to California partners, with strategic partners and investors in California, the California Israel Chamber of Commerce (CICC) announces its 2nd Israel Cleantech Tour & Summit in Palo Alto, California. According to the CICC, the Summit will be a full day showcase and series of presentations by Israeli cleantech delegate companies on April 27, 2010 in Palo Alto, California. 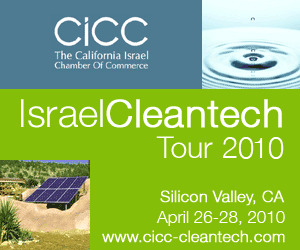 The tour will include the delegation of Israel companies and investors, and CICC sponsors and partners and will include private visits and meetings with leading California cleantech facilities, companies, investors, policymakers and utilities on April 26 and 28. Updates will be appearing as they happen at a special CICC-hosted website here. The CICC says this 2nd event is happening after its sold-out, standing room only crowd at the first CICC Israel Cleantech Tour. The CICC Cleantech Initiative has already succeeded in stimulating advanced collaboration, investment and partnerships in areas that present challenges and opportunities to both Israel and California — including water, renewable energy, smart grid, energy efficiency, and environmental technologies. What does CA and Israel have in common? California’s Governator signed a clean tech coop deal with Israel late in 2009; Mekorot, Israel’s national water carrier plans to make a splash in CA’s Valley; you couldn’t have missed the news between BrightSource, the Israel solar company and PG&E. These are just a few examples of CA-Israel cleantech cooperation. Recent sponsors, partners and speakers at the CICC events have included GE, PG&E, California Public Utilities Commission, US Department of Energy, Perkins Coie, SRI, Sunpower, Chevron, USVP, Intel, Applied Materials, Greylock Ventures, Battery Ventures, BrightSource Energy, Silicon Valley Bank, Energy Recovery inc., Israel Cleantech Ventures, Vantage Point Venture Partners and many others. A similar cleantech event is also scheduled for Texas and Israel this February. Next Next post: Mozart, A New Natural "Drug" To Help Preemies Gain Weight?